Arrival honors tendered to MajGen. Rodolfo Demosthenes Santillan AFP, Vice Commander, Philippine Army during his visit at Headquarters 8th Infantry (Stormtroopers) Division, Philippines Army on May 14. 2016. CAMP VICENTE LUKBAN, Catbalogan City – The Army’s second high ranking officer pays visit to the home of 8th Infantry (Stormtroopers) Division May 14 2016, here, Saturday. The 8ID tendered Military Honors to Maj. Gen. Rodolfo Demosthenes C Santillan AFP at Openiano field and warmly welcomed by Maj. Gen. Jet B. Velarmino AFP, Commander, 8ID together with the officers and enlisted personnel of the Command. The historic visit focused on the updates on Peace and Development efforts in the region which the 8ID plays a significant role in “winning the peace”. Further, he conducted talk to the Stormtroopers to inform the members of 8ID on the current trust and program of the Philippine Army. Maj. Gen. Santillan, congratulated the Command for the successful 2016 Automated National and Local Elections in the region despite of numerous challenges encountered by Army forces on the ground. He is very thankful for the integrity and dedication to duty of every soldier for a Peaceful, Credible, Orderly and Safe Election. 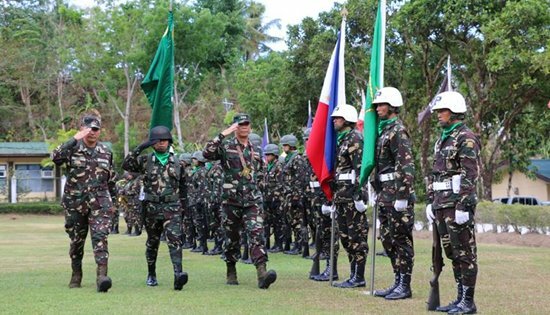 “Maj Gen. Velarmino, in his message said that the 8ID is very thankful for the trust and confidence of the leadership of the Philippine Army, while we are advancing and transforming we remain to be committed on our mandate in serving the people and securing the land for a just a lasting peace in Eastern Visayas”. “The 8ID is the vanguard of peace, respect human rights and pursue the path of good governance”, Velarmino added. QUEZON CITY – Karapatan calls on presumptive President Rodrigo Duterte to reconsider the planned appointment of Lt. Gen. Ricardo Visaya as Armed Forces Chief of Staff. Visaya is a protégé of Ret. Gen. Jovito Palparan, known as ‘The Butcher’ because of his bloodied human rights record. Visaya was the ground commander during the 2004 Hacienda Luisita massacre where seven farmworkers were killed. He was also commander of troops in Central Luzon and Metro Manila involved in rights violations during Arroyo's reign of terror during the implementation of the counterinsurgency program Oplan Bantay Laya. Among the known victims in Central Luzon were Raymond and Reynaldo Manalo, two farmers who were abducted and tortured. In Metro Manila, Visaya’s stint was marked by military encampment in urban poor communities in 2006-2007, in time for the 2007 elections. Visaya was among the generals promoted by the Aquino regime, despite their stained human rights record. He was promoted as 4th Infantry Division commanding general, the unit responsible for killing and forcible evacuation of farmers and Lumad in Caraga and Northern Mindanao regions. Instead of being promoted, Visaya should be prosecuted for the crimes he committed against the Filipino people. Dr. Noel Albelda, Municipal Health Officer of Kananga, Leyte and his team is shown here performing circumcision at 19th Infantry Battalion’s Sandiwa Hall in Brgy. Aguiting, Kananga, Leyte on May 14, 2016. KANANGA, Leyte – The Rural Health Unit (RHU) here chose an Army camp as venue of its Operation Tuli on Saturday, May 14, 2016. For the first time, Dr. Noel Albelda, Municipal Health Officer and nine nurses performed circumcision to thirty young boys from ages 5-10 at the headquarters of Philippine Army’s 19th Infantry Battalion in Brgy. Aguiting, Kananga, Leyte. Lt. Col. Roberto Sarmiento, Commanding Officer commended Kananga’s free circumcision program which benefitted indigent residents of the community near the 19th Infantry Battalion’s camp. “This operation tuli is a big help to the families’ budget, especially now that enrollment of classes is fast approaching”, Lt. Col. Sarmiento said. Parents took the opportunity of bringing their sons to avail of the free circumcision than paying at least P600.00 circumcision charge in some private clinics. On the other hand, Public Health Nurse Joseph Oliverio said that Kananga Rural Health Unit has already circumcised around 700 young boys since March this year. He furthered that residents of Kananga may still avail of free circumcision at the Rural Health Unit from Monday to Friday, 1:00 to 5:00 o’clock in the afternoon. QUEZON CITY – As presumptive president Rodrigo Duterte prepares for the transition to assume the reins in July, Karapatan echoed the call to release all political prisoners and the resumption of the long-stalled peace negotiations between the Government of the Republic of the Philippines (GPH) and the National Democratic Front of the Philippines (NDFP). “We challenge the Duterte presidency to build on the people’s votes that was mostly repudiation of everything that is the ‘tuwid na daan’. He can start by junking Oplan Bayanihan and similar counterinsurgency programs and take the road to genuine peace by addressing the roots of unpeace and the ongoing civil war through the negotiating table,” said Karapatan Secretary General Cristina Palabay. Karapatan said farmers and indigenous people, especially from Mindanao, have been calling for the immediate pull-out of military troops from their communities. Operations of the Armed Forces of the Philippines have resulted to 318 killings and forcible evacuation of thousands under the Aquino administration, Palabay added. “There are still more than 2,700 evacuees at the Tandag Sports Complex in Surigao del Sur and at the United Church of Christ in the Philippines-Haran in Davao City. The pull-out of military troops in their communities and the disbandment of paramilitary groups can enable them to go home,” she said. There are 88 ailing and 48 elderly among the political prisoners, mostly poor peasants fighting for their land rights. 8ID commander MGen Jet Velarmino, Asst. Division commander; Col Cesar Idio, 801st Brigade commander; Col. Perfecto Rimando lead the contingent of mountain bikers and riders from Sta. Margarita to Calbayog City, Samar during the "Bike for PCOS" on May 7, 2016. CAMP VICENTE LUKBAN, Catbalogan City – The 8th Infantry (Stoormtroopers) Division, Philippine Army conducts a 10-km “Bike for Peaceful, Credible, Orderly and Safe (PCOS) elections in Sta. Margarita Town Hall to Calbayog City Plaza, Samar on 07 May 2016, Saturday. Maj. Gen. Jet B Velarmino, Commander, 8ID kick-off this peace initiative to promote a clean automated national and local elections 2016. This historic “Bike for PCOS” elections was attended by 150 mountain bikers that came from the different areas of Samar and was also participated by Engr. Wilfredo Bordios, Representative from the Commission on Election (COMELEC); Col Perfecto M Rimando, 801st Brigade Commander; Col Mario S Lacurom, 803rd Brigade Commander; Director Edgar L Posadas, Office of Civil Defense-8; Rev. Fr. Richard Tan, Parish Pastoral Council for Responsive Voting (PPCRV), Diocese of Calbayog; Samar Mountain Bikers Association (SAMBA); Samar Off-Road Bikers Association (SORBA); Calbayog City Police Office; Philippine Coast Guard; Road Master Wheelers Club; and 8ID bikers. The 8ID is steadfast in upholding our advocacy for the successful election through series of peace covenant signing, checkpoints and dialogues under the auspices of the Joint Regional Security Coordinating Committee – 8 (RJSCC-8) to address election concerns in the AOR. Col. Rimando said that the Army forces in Samar are apolitical and sincere in upholding the laws to prevent threat groups from disturbing the electoral process and to undertake precautionary measures against private armed groups (PAGS) as well as advance people’s rights to suffrage without intimidation. Maj. Gen. Velarmino, ensured that all soldiers are well informed and knowledgeable on the AFP-PNP joint operational guidelines as deputized by the COMELEC. “The Philippine Army remains to be the vanguard of peace will defend the citizenry in Eastern Visayas”, Velarmino, added. CALBAYOG CITY – Gandara Diversion Road, located in Gandara, Samar, is a newly declared National Road from an unclassified road, under the jurisdiction of the Department of Public Works and Highways (DPWH) -Samar First District Engineering Office (SFDEO) pursuant to Department Order No. 74, dated 06 April 2016, issued by Honorable Secretary Rogelio L. Singson. The diversion road has a total length of 1.40 kilometers including the 700-linear meter Gandara Bridge. Road and bridge construction was undertaken phase by phase by both the Regional and District Offices through the yearly Regular Infrastructure Fund which resulted to its completion in the year 2011, under I&E Construction. As per request, dated October 5, 2015 addressed to Ma. Catalina Cabral, PH.D., CESO I, undersecretary for Planning and PPP Service of the Head Office thru: Regional Director Rolando M. Asis. Subject: Request for classifying the Gandara Diversion Road into Primary National Road and Downgrading the part of Daang Maharlika (K765+000-K766+000 which is within the Poblacion of Municipality of Gandara, Samar) from Primary Road into a Secondary Road. Some reasons cited in the said request are dilemma in heavy traffic due to loaded cargo trucks, various vehicles which transport in Gandara Poblacion and number of vehicular accidents often occur in this road. 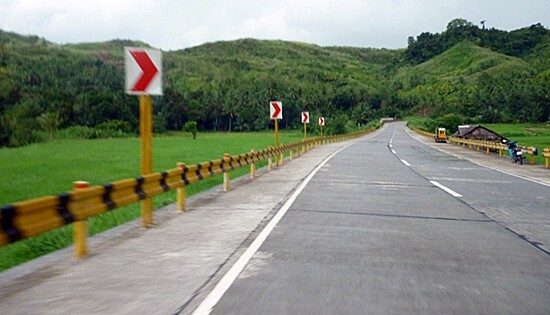 Having been converted into a national road, Gandara Diversion Road provides alternate route and access road with the provision of permanent structures for the flow of traffic when approaching the Municipality of Gandara, will serve as avenues for a hassle-free road and safety assurance for the drivers, motorists, and pedestrians. BILIRAN – The Department of Public Works and Highways (DPWH) -Biliran District Engineering Office (BDEO) is fortunate to implement six Farm-Market Road Projects (FMR) amounting to P42M funded by the Department of Agriculture (DA) under the FY 2016 General Appropriation Act (GAA). This is revealed by Acting Chief of Planning and Design Section, Engr. Rosario B. Rosete during their meeting with BDEO Planning and Design Engineers on April 29, 2016. The six FMR projects are the Opening of Brgy. Mapuyo - Palayan ng Bayan FMR, Brgy. Mapuyo, Kawayan, Biliran – P10M; Concreting of Caucab to Sitio Palayan FMR, Brgy. Caucab, Almeria, Biliran (Phase II) – P10M; Concreting of Brgy. Canila FMR, Biliran, Biliran – P6M; Concreting of Cabibihan to Victory FMR, Brgy. Cabibihan, Caibiran, Biliran – P4M; Concreting of Tabunan-Matanggo-Caucab FMR, Brgy. Tabunan, Almeria, Biliran – P5M, and Concreting of Brgy. Bunga-Sitio Capayas FMR, Brgy. Bunga, Cabucgayan, Biliran – P7M. According to Engr. Rosete, the six FMR projects are already under the Preliminary and Detailed Engineering which includes the conduct of survey/ site investigation, designing, preparation of plans, and programming. Farm to Market Road projects is one of the priorities of the Department of Agriculture to provide access from the interior Barangays going to the National Roads of the District. This roads will pave the way for local settlers to access places in the province that are hard to reach and at the same time allow farmers to transport their farm products to market centers with ease. BATANGAS CITY – Around 10,000 Filipinos marched here today, five days before the elections, to demand that the next administration cancel all proposed coal plants nationwide and hasten a transition to renewable energy. “We are facing a planetary emergency. Now more than ever, we need leaders who are pro-people and pro-environment, not pro-coal and pro-climate change,” said Lipa Archbishop Ramon Arguelles, who led the march to the Batangas Provincial Sports Complex. 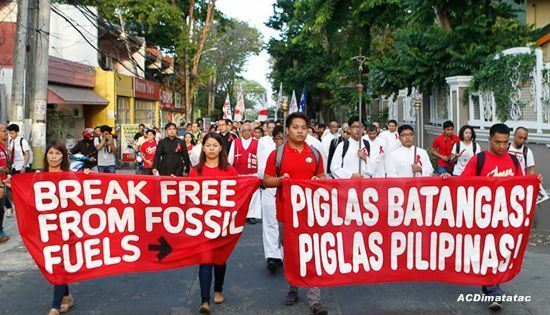 The anti-coal march highlighted a national campaign called “Piglas Batangas! Piglas Pilipinas!” symbolized by the struggle against the proposed 600-megawatt coal plant of JG Summit Holdings in Barangay (Village) Pinamucan Ibaba, Batangas City. The opposition to the plan is led by the Lipa Archdiocesan Ministry on Environment, local fisherfolk, and other concerned citizens. “Even without the coal plant, the existing plants of JG Summit are already poisoning our air, water, and land. The proposed coal plant would only make it harder for us to breathe, much less fish,” said 27-year-old Reymond Mendoza, a fisherman from the nearby barangay of Simlong, which also hosts the Gokongwei family-owned complex. The complex has a petrochemical and naphtha cracker plant. The local anti-coal groups were joined by other coal-affected communities from Quezon and other parts of the country, as well as people’s movements and civil society groups from Metro Manila and other provinces in Southern Luzon. “Piglas is a call for the incoming president and other new government officials to scrap the Pinamucan coal plant and the other 26 proposed coal plants currently in the pipeline. It is also a demand for the phase-out of the 19 existing coal plants nationwide,” explained Ian Rivera, national coordinator of the Philippine Movement for Climate Justice. “The next administration must review the current one’s commitment to reduce 70% of our country’s emissions by 2030. It must also demand climate finance from developed countries, as well as mobilize its own resources, so it can implement a swift and just transition to clean and renewable energy,” added Ruel Cabile, national coordinator of Aksyon Klima Pilipinas. The campaign is part of a worldwide movement and the first in Asia to join “Break Free from Fossil Fuels 2016”, a global wave of peaceful direct actions across 12 days and six continents. Mass actions are scheduled until May 15 in other countries including Indonesia, Nigeria, Brazil, the United States, Germany, and Australia. “Under the banner of Break Free, the global climate movement is proclaiming the end of fossil fuels, challenging governments to concretely respond to the climate crisis and the urgent need to keep global warming below 1.5⁰C,” said Lidy Nacpil, coordinator of the Asian Peoples Movement on Debt and Development and global steering committee member of Break Free. Other communities will also be holding solidarity actions in Cebu and Calaca, Batangas, which hosts the oldest coal plant in the country, among other areas. “Piglas Batangas, Piglas Pilipinas is our battlecry for a safe, peaceful, and sustainable society. Batangas and the rest of the Philippines will not bow to those who think of nothing but profit instead of people and plunder instead of protecting the environment. Coal represents darkness, and Break Free is our source of light, especially for all communities who are standing up in the face of the fossil fuel industry's relentless expansion despite climate change and the people's clamor for climate justice. Today we declare that we will break free from coal,” said Naderev ‘Yeb’ Saño, executive director of Greenpeace Southeast Asia. MAKATI CITY – Edtech startup Edukasyon.ph and University of Asia and the Pacific (UA&P) have joined forces to create an online education information service to give OFW parents a faster way to know about senior high and college options available for their kids. Edukasyon.ph Chief Executive Officer Linartes M. Viloria and University President Winston Conrad B. Padojinog inked the agreement on April 26, 2016 at the University of Asia and the Pacific campus in Ortigas. “We are very excited and happy to be partners with University of Asia and the Pacific in providing online application assistance for inbound college and senior high school students. This is particularly helpful for our OFW parents who are helping their children decide on their school options all the way from abroad. This way our OFW parents can still participate not only in the decision-making but in interacting with schools for their kids’ education,” said Edukasyon.ph CEO Linartes Viloria. Through this partnership, UA&P can accept online applications via Edukasyon.ph. This year UA&P launches its unique 6-year Integrated University Program (6YP) which is open to all Grade 10 graduates. 6YP combines two years of senior high school, three years of undergraduate program, and the final year for a Master’s degree, all within six years. “Parents and students can explore a variety of academic options through their account on Edukasyon.ph website, which features information about 6YP, events, admissions, enrollment announcements, scholarships and qualification requirements”, said Beng Calma-Alcazaren, U&AP Marketing Director. The following degrees may be obtained through the 6YP: Master of Arts in Communications major in Integrated Marketing Communication, Master of Arts in Humanities, Master of Science in Management, Master of Science in Industrial Economics, Master of Science in Political Economy with specialization in International Relations and Development. “We want to help our parents participate in their children’s education regardless of how far they may be. With the signing of the MOA with UA&P, Edukasyon.ph is bringing the Filipino youth closer to their dreams. We believe that this partnership is one of the many steps we have to take in order to provide our students quality information that can lead to brighter jobs,” Edukasyon.ph Founder Henry Motte-Muñoz emphasized.